In one of my past blogs I mentioned that I was experimenting with an off camera flash in nature detail images. I used a radio remote trigger to fire the flash from different angles off camera axis. The results have been interesting and I find myself shooting a lot of detail images on my hiking trips to improve on the technique. To achieve the results I have been looking for, I set my tripod mounted camera on automatic (not program) and mount a radio slave trigger to the hot shoe mount. I use one of two flashes, depending on the situation. A Nikon 600 for smaller projects and a Sunpak 644 for bigger. Both are connected to a radio slave receiving unit. (I've been using an inexpensive Andoer radio slave system for the outdoor shoots. It works well and, if damaged, easily replaceable). I set the camera at f22 and use the mirror lockup remote system with an infrared remote control. I use a cheap off brand remote trigger with my Nikon d7100. Again, it is easily replaceable, it works and is compatible with the camera. My shutter in the automatic mode is usually between 1/30 and 1 second with the iso set at 400. To add some more drama to the image I moved the light to a ninety degree angle left of the lense and even with the stump. This increased the shadow area and added more depth to the image. The next image and the ones to follow show some of the results from my excursion into lighting in nature. 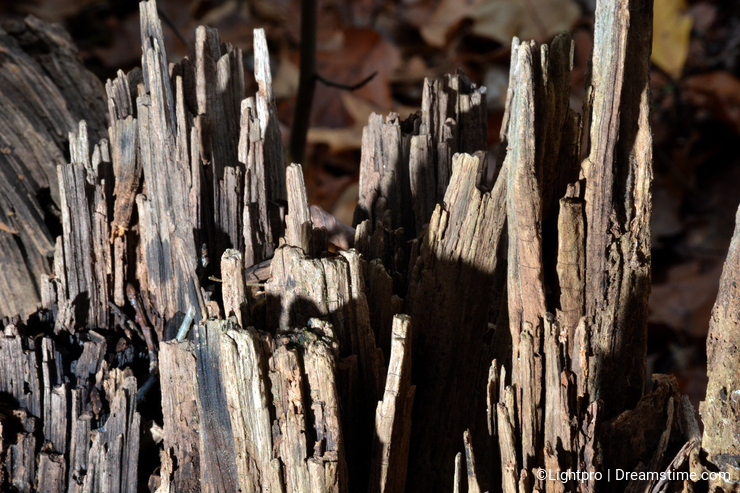 This image is a rotting log on the forest floor. 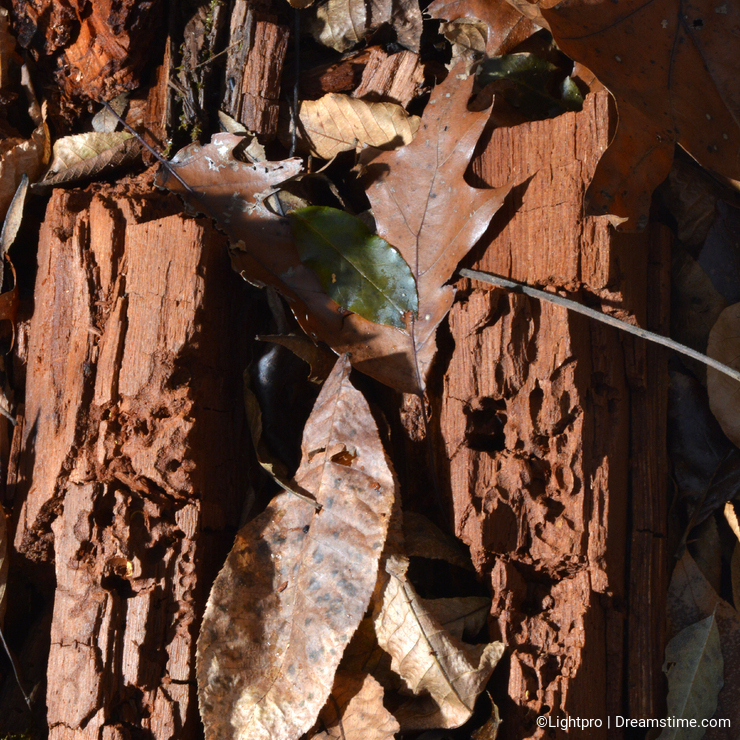 The shadow created accents the texture of the decaying wood and further saturates the color. 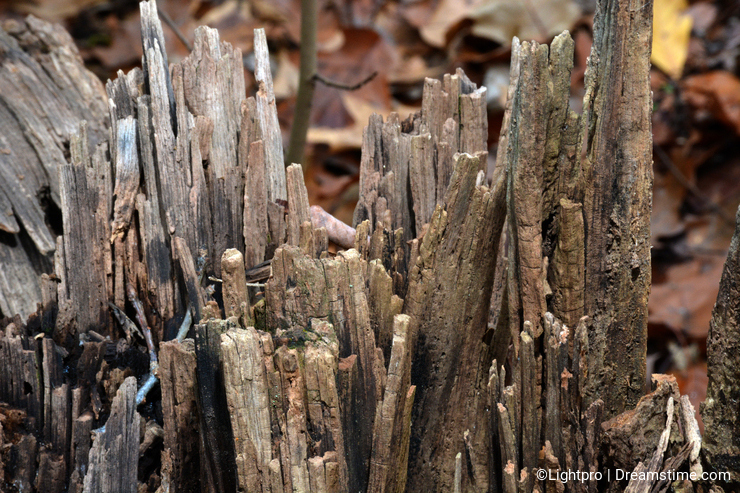 The next image is that of another dead stump in the forest. The light is at a 45 degree angle from the camera lens axis level with the lens. Again creating dramatic shadow on the surface of the stump, giving the illusion of a cliff wall with small caves and jagged edges. The color is deeper because of the angle of the light so the variances are more pronounced. The last image has an otherworldly quality about it. The end of a log with small fungi growing on the lower right area. 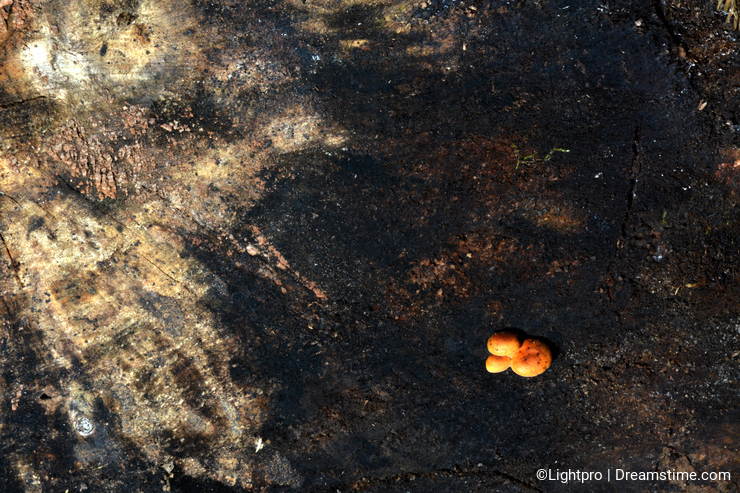 When lit at a more extreme angle (about 60 degrees) the lighter area of the log appears to be a light source and the fungus almost appears to be a heavenly body. The image takes on the appearance of a photo of a part of the universe. 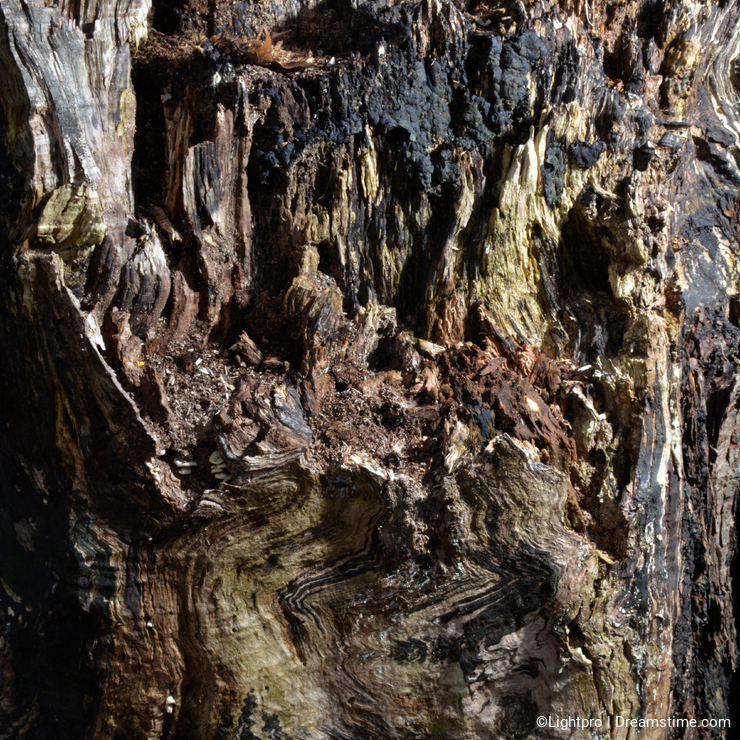 Or you can view it with no imagination and see the end of a log with some fungus on it. The image you see is up to you. The use of an external flash on camera has been around for a long time, but off camera flash work even longer, dating back to the beginnings of photography and flash powder lit by a match. Moving the light around creates different effects. Learning to see the light and the optimum direction for the image or effect desired takes time and practice. A small investment of less than $50 made the images possible. I hope I have inspired you to push your limits a little further. You will only improve your knowledge of light and photography while developing your own special style and vision. Good luck Linda. Experimenting is the best way to learn. Learn the rules first though. That way when you make a mistake that works you will know how to repeat it. Some of the best lighting techniques I use started out as mistakes. I am just beginning to branch out into various lighting augments. Your images definitely show what is possible. Nice! Thank you!